This year we’re looking to branch out from just focusing on Blood Bowl to explore other amazing games. Guild Ball is a game that I have been playing for a number of years casually, using the prize vouchers from my first Blood Bowl tournament win to buy the season 1 rulebook. As the game moves into its 4th season (version of the rules) it has really started to settle into a great place. The game is young enough to have been built on some very modern designs, but now old enough that the early problems and imbalances within the rules have started to be ironed out. 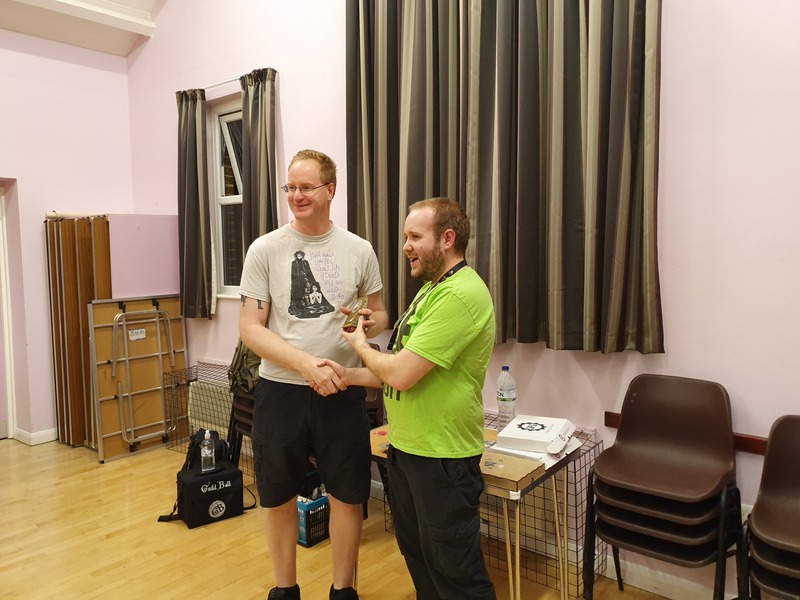 I resolved to play more this year, and so it was that I headed to my 2nd tournament of this game, excellently run by the wonderful Alex Brooks. I’m also breaking a rule in writing this in that I think articles work best when they focus on just one thing. But I’m aware that the majority of readers of this website may not even have heard of this game. So this is going to be half a tournament report and half an introduction where I look at some of the game design decisions that relate to playing in tournaments as well as giving the information required to understand the game. If Blood Bowl can be described as American Football with violence then Guild Ball is regular football with violence. 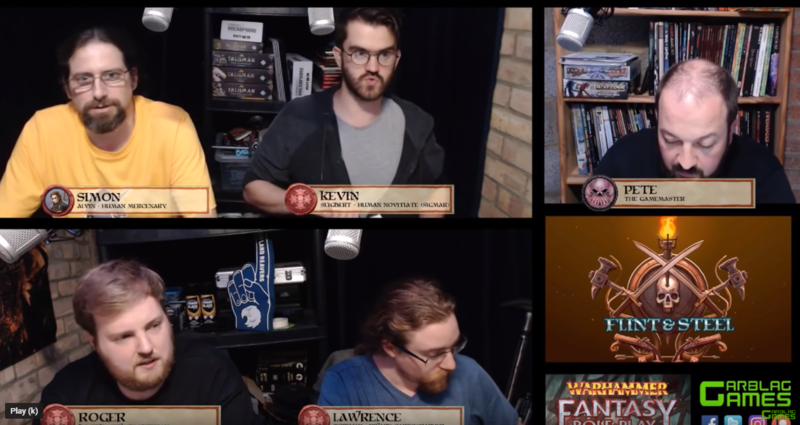 However instead of the teams being drawn from the different creatures of a Tolkeinesque world they are taken from Guilds which represent medieval professions, and help define the playstyle of the team. 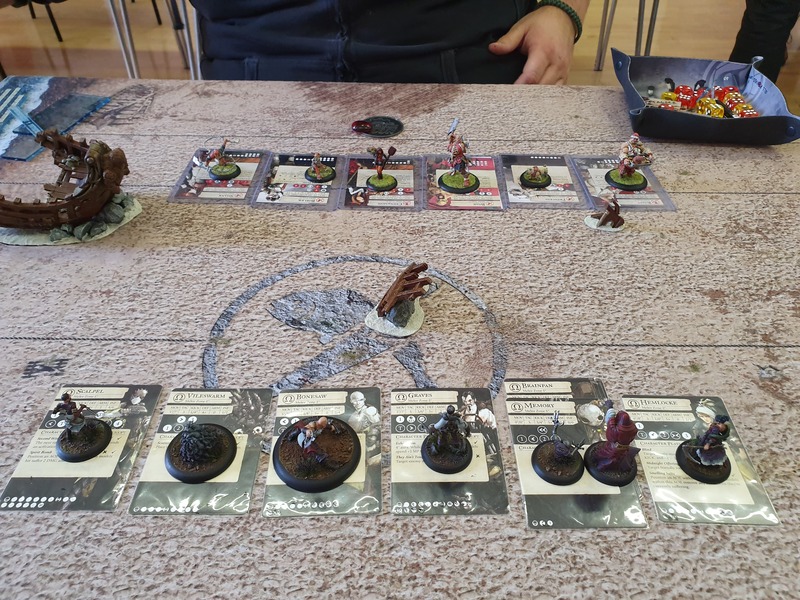 There are the heavily armoured Blacksmiths team, the damage focused Butchers team who want to make their opponent’s bleed, or my favourite team – the Morticians. As every tournament player knows before you can play a game you need to build your army. This is an area where Guild Ball cleverly deviates from most in that there is no point buy system. The players are split into 3 types: Captains, who are the strongest players on the team and determine the playstyle you intend to attempt; Mascots, who are weaker quirkier players who are often an animal; and Squaddies who are your main troops. Every team is made up of 1 Captain, 1 Mascot, and 4 Squaddies for a total of 6 players. As long as you obey that rule you are free to select any 6 you like from the available options. This is very simple in practice but fiendishly complex in design as you attempt to find out the best combinations. Tournaments have an extra rule. Whilst you might have 15 or 16 players to select from entirely you have to restrict these to just 12 for the duration of the tournament, which is known as your squad. At the start of a tournament game each player must show their opponent their squad and then in secret they select which Captain and Mascot they want to put forward in their 6 for that game. These are simultaneously revealed; after which the players alternate picking one Squaddie at a time allowing for some cat and mouse in selection. My beloved Morticians have some strengths and weaknesses. As a control team I have a lot of flexibility in how I want to play, but I don’t do anything particularly well. This can help to keep the opponent guessing but if I am not careful I will simply be blown away by the opponent’s Plan A. If they want a fight then I need to back off and play Football. If they are looking for 3 fast goals I need some killers to take out the threats. Very rewarding for good players. An absolutely nightmare for a noob like me. But I shall not be deterred! To glory! I appreciate that the stats won’t mean much to players unfamiliar with the games. So here’s my rough guide. High movement is good. High TAC (the number of dice you throw) is very good. Kick is fairly unimportant in that the players that need it tend to have it and those that don’t do not. Defence is what the enemy needs to roll equal or above to hit you whilst armour is the number of successes that need to be removed. Generally if you add them together you want it to equal 5 and any lower is bad. Inf is the number of action points they get so the higher the better. The first is how many are generated to be spread over your team (normally between 11 and 13), whilst the second is the maximum number you can assign to that player. As every action requires influence these are critical to the game. The section below is called the Playbook. After you attack an enemy the number of hits you get allows you to pick one result from any column up to the number of hits you achieved (so 4 hits allows you to pick one result from any of the first 4 columns). Numbers are damage so higher is better. Chevrons are pushes and dodges and you generally want to have at least one of them in the first 2 columns. A Guild Ball symbol allows you to power an ability from the Character Play section of the card. Dark coloured results also generate momentum which is a very important resource to build up. T is to tackle the ball, and KD is very importantly to Knock Down an enemy. You want at least one of those in the first 2 columns as well. In the character play section anything that allows extra movement, extra TAC, a dodge, or putting a condition on an enemy (poison, burning, etc.) is good. On the other side of the card there are too many things to list as being generally good or bad so I will reference them with the player. The graphics that follow are mainly intended to be for an aesthetic – if you want to read what the cards are more clearly (i.e. larger) then follow this link and scroll down to the teams section where the pdf files can be viewed. Obulus is one of the core players that has not changed much right from the start of the game. His big ability is that he can Puppet Master an enemy player which can force the other side to give up the ball or helplessly move towards your team to get beat up. Whilst quite slow his dodging helps – especially as the enemy cannot get free Parting Blows when you dodge away. The downside is that Puppet Master costs 4 influence, which could be 1/3rd of your entire influence stack for that turn so whilst powerful you can’t just use it without a plan. I mainly took Obulus as a distraction as I intended to run Scalpel the entire tournament just because she is more fun to play. Scalpel is the season 2 captain and has been much improved in season 4 in both competitiveness and fun. With the ability to ignore a point of enemy armour she is quite killy, and with her signature ability Voodoo Strings she is able to push around all players on the pitch when she is hurting someone. A 2” push may not sound that good but it is huge as she can drag enemies into a fight they don’t want, get friendly players safe, and spoil enemy plans. Vileswarm is a pile of rats. They used to be lol dreadful but buffs in season 4 has made them fun to play. Synergies with Veteran Graves (more later) and the ability to charge for free (normally costs 2 influence) makes this mascot surprisingly dangerous if used well. I was happy enough with just having this mascot that the other one, Dirge (a bird) did not make it in the 12. Cosset is a crazed young lady who again is surprisingly dangerous. Like Vileswarm she can charge for free, but also has an ability to drag an enemy player towards my lines. Great for isolating a tough enemy for the rest of the team to kill. Silence used to be a mainstay of the Morticians but despite getting an improvement in season 4 has been overtaken by other players. However he still makes the squad because of one special set of abilities – the option to try and make an enemy player either go next or to go last. Certain teams are very dangerous when they get to select the order in which they move, such as buffing up a killer player who then steams in to take out half your team. Disrupting this sequence can flatten a few teams but not many. He makes the squad nearly every time but rarely sees play. Bonesaw used to be terribad. Like omg bad. It got to the point where people took him basically as a challenge to other Mortician players to troll them (look I can win even with this guy). Not so in season 4 as his free extra move gives him the ability to score goals from distance, and the ability Meditation allowing all dice to be rerolled means that he can score even when suffering a little disruption from the enemy. Veteran Hemlocke is newer to the team. Part of the lore of the game is that players often improve or change team, and this leads to them getting a new option, often prefaced with ‘Veteran’. The original Hemlocke plays for a different team but often the original and veteran play for the same team. Whilst you cannot have both on the pitch at the same time you can have both in your squad. Veteran Hemlocke (or vHemlocke) brings a tasty Blind, condition remover, bonus move in her Legendary play (a special ability that can only be used once a game), as well as a 2” melee range which is rare for Morticians. A fantastic utility player. Original Graves (or oGraves) is a bit of a mixed bag of a player. The Tooled Up ability is extremely powerful when put on a killer with a lot of influence (like Scalpel) as it can mean the difference between killing and not killing someone during the activation. But otherwise I struggle to see his place as he doesn’t do a lot of damage himself. His best move is to charge in solo, hope to get Scything Blow off with no friends nearby and a lot of enemies around. Quite suicidal. Veteran Graves (or vGraves) is quite the opposite of his formal self. Whist the loss of Tooled Up is huge he makes up for it by being great at holding onto the ball, being one of the few Morticians player with an easy Knockdown, and synergising really well with Vileswarm. Pretty much an auto-include in this team. Casket is a hulking monster with a lot of debuffs and a fantastic special move. Triggering his legendary can put an enemy player in the coffin he carries around. Not only do the other side lose that player for a turn but you also score 4 VP instead of 2, meaning that you can win the game by killing one fewer enemy player. With a lot of health and armour soak he is also one of the few brawler Morticians. Brainpan & Memory are a freaky fun pair that can give a lot of football and damage options. Memory is a puppet who doesn’t get influence or their own activation but can be controlled by Brainpan. With a short playbook there is the chance of a wrap (where you get more hits than you have columns so are allowed to pick a second result, or even third etc if you wrap enough times) if support is nearby. 5 hits for 3 damage + 1 damage is a pretty easily achievable huge result – especially if Tooled Up by oGraves for 6 damage an attack. However enemy teams with easy Knockdown access can mess it up. Brainpan, when not controlling the puppet, has a very special ability called I’m Open which is one of the few times you can receive a pass from a friend in your activation. The combination is also great fun to play. 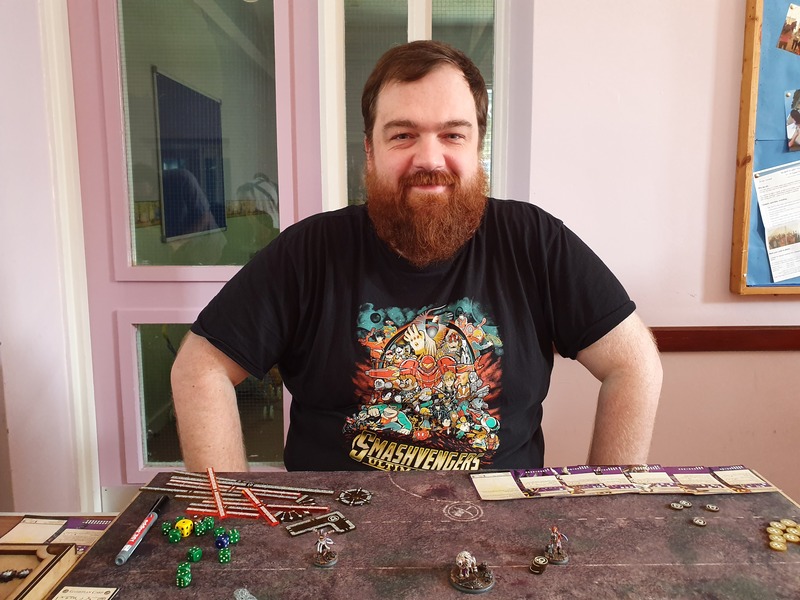 Skulk is the last player in the squad, and technically is not a Mortician but a Ratcatcher – a minor guild allied to the Morticians from which they can share some players. Skulk is an out and out goalkeeper. When I know I will be up against a star striker like Flint or Mist this guy makes the pitch so is an essential pick for the squad. Game 1 vs Mark Rickell (Brewers). I was, quite simply, just outplayed in this game by an opponent with more experience and far more skill. One of the interesting things about the game is how quiet turn 1 can be. Both teams start out of range of each others and so you either need some sort of trick for something to happen or you are setting up your formations ready for turn 2. In this sense it is a lot like chess where opening theory is an important part of the game. I think that I have just about got to grips with the basics but then find that I struggle into turn 2 to get the team to do what I envisage them to do. In this match up Brewers are the brute team, looking to dominate in combat with some very dangerous players. My job as Morticians is to hamper them in that. I was looking for 2 goals and 2 takeouts, and was delighted when I was receiving the ball. A first turn Bonesaw goal would put me well on the way to that aim. In addition to Scalpel and Vileswarm (who I took in every game), I added the usual vGraves and vHemlocke. For my final choice I decided I needed someone who could act as a focal point to take a bit of a hit as well as provide some good control, and so I picked Casket. With Tough Hide (-1 damager per result) he had a chance of surviving a round of being beaten on, plus he also has Reanimate meaning the first time he is taken out in a round he can revive back to 3 health. He also lowers enemy movement nearby and has a couple of nice debuffs. But most importantly his Legendary Play could allow me to score 4VP for a single takeout, meaning that I might only need 2 goals and 1 takeout (or 1 goal and 3 takeouts). 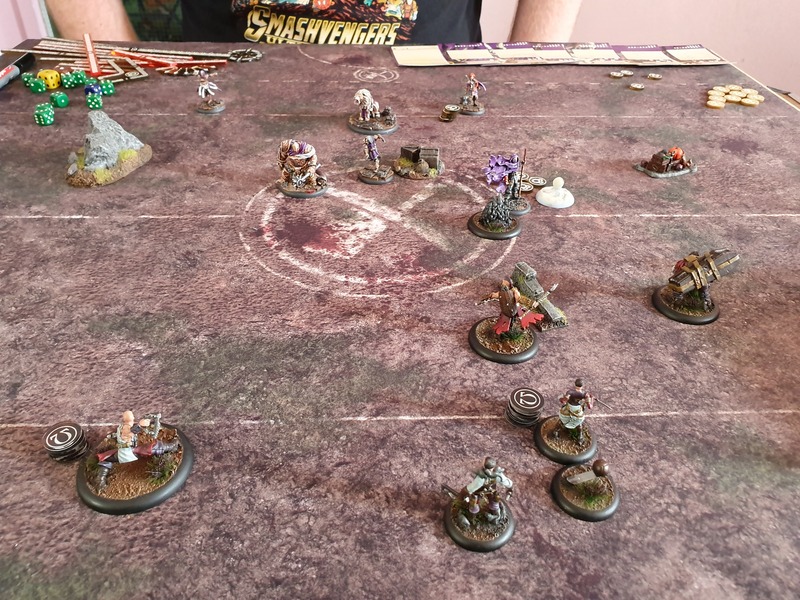 The first turn order started well with vHemlocke collecting the ball and passing to vGraves (with me saving the point of Momentum generated from it). His Close Control and low knockdown made him a deterrent to anyone trying to quickly tackle the ball from him and score against me. Close Control meant I could ignore the first tackle result and, if I declared a counter attack (using the point of Momentum gained from the pass), I could knock down the enemy player with just 2 net hits. The players jostled for position and then at the end Bonesaw went on his goal run, scored, and was then taken out. I led 4-2 but the attacks against Bonesaw right at the end gave Mark enough Momentum to guarantee going first next turn. And this is where my plan fell apart. Lacking the skill to do what I wanted and keep range I was swiftly over-run by the Butchers. And whilst I did make 1 take out in return my inability to keep distance made me too easy pickings for a skilled player. Mark notched up takeout after takeout and then knocked in the winning goal. Despite the loss I was pleased with how I had played overall as I was concerned I’d have forgotten how to get the first turn right. And there’s no shame to losing to someone of Mark’s quality of game play or company. But at least I got one game on the top table, even if it was just in the random draw of the first round! Game 2 vs Matthew Swann (Order). Order are a team that have recently seen a big change to their play, and one that I had never faced before. The biggest praise I can give to Steamforged is that they are a company that cares and listens. Order were a pretty wretched team in that they didn’t have much of an identity, and hearing the feedback the Guild Ball designers made a very clever change – they gave the team a second ball. So now a player out of range can pass the ball, use the Momentum to make a 4” dodge, and then do something dangerous. And this is particularly lethal when a certain annoying player is on the pitch. Say hello to Mist. In earlier editions of the game there was a guild call the Union, which acted like mercenaries. Each guild had access to 6 Union players of which they could field 1. As the Morticians didn’t have a good goal scorer (Bonesaw was trash until S4) this meant that many Morts players that wanted to score goals would take Mist. Many Morts players including myself. That all changed in Season 3 with the introduction of the minor guilds. Any guild that had a minor guild released, for balance, lost access to their Union picks. Ratcatchers were the first to be released meaning I lost Mist. Although it should be noted that not all guilds have their minor guilds yet, and these are still allowed to pick from Union players. So I knew Mist very well. My opponent this game was Matthew Swann, and he was immediately at a disadvantage because he had only painted the 6 players. Some very good, and – well one not so good (Grace). Once again I received having picked Scalpel and Vileswarm as my Captain and Mascot. As minor guilds have fewer players (a base 6 plus 2 options from the major guild) it is easier to out-pick them in the line ups. As a balance they get a +1 to the roll to decide who gets to pick the kicking team so I was lucky to have still won that (after 2 rerolls for ties!). vGraves and vHemlocke were back in the team alongside Bonesaw, but this time for my 4th pick I selected Skulk. Yes I was that afraid of Mist! Mist kicked looking to play his normal trick of using the run forward form the kick to be in range for the quick tackle and score. But my pass was good and vGraves had the ball with friends around and Skulk making things even more dangerous. Matthew wisely elected not to trigger Mist right away and I elected not to go for the Bonesaw goal either as Matthew also had a goalkeeper in the form of a killer counter attacking lion. 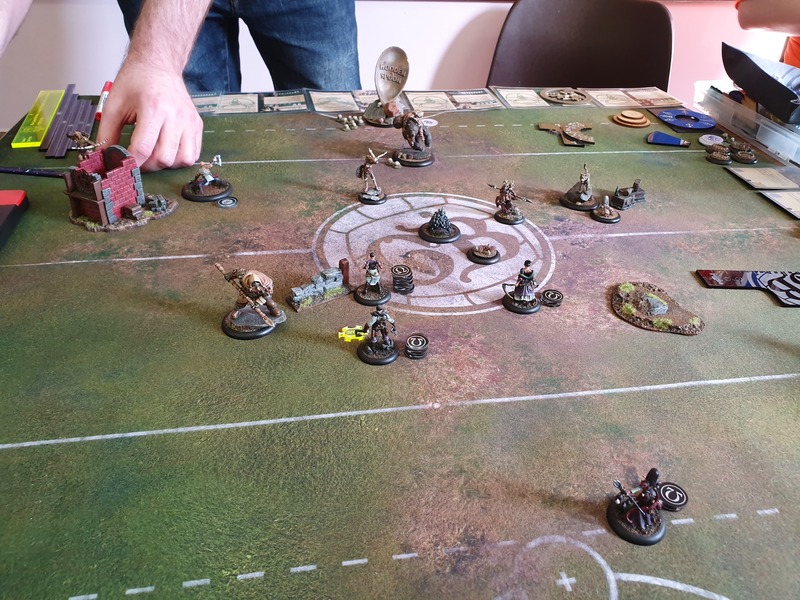 This resulted in a cagey game where I didn’t want to open my lines for fear that Mist would sneak in and steal the ball, and Matthew didn’t want to over commit and lose players and then get over-run. This lasted for 3 turns. And then all of a sudden the game was over. A slight change in balance saw Matthew take out a couple of my players before Scalpel then went on to steal the show. She charged in against a mostly healthy Benediction and started a run of damage attacks to use Voodoo strings to reposition players around and leave him on 1 health. On the second to last attack she then moved closer in Grace who was on 1hp and then on the final attack triggered Spirit Bomb to take out both of them. Then next turn she received the ball and ran up the pitch to score the first goal of the game, putting me 8-5 ahead. Matthew replied with a goal run of his own to get back to 8-9. But the goal kick was kind to me and landed close enough to Bonesaw that he could take the ball and get far enough upfield to pass to Scalpel who was within range to snapshot the winner! Game 3 vs Paul Sutton (Hunters). This game was one of the most enjoyable I have played and yet was also one of the most frustrating gaming experiences I have ever had. 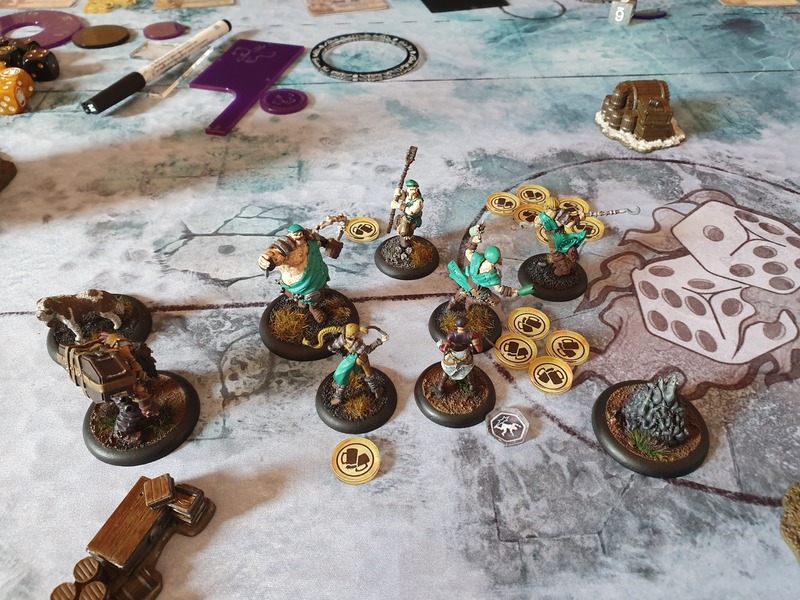 It is important to note that Guild Ball is a game where the complexity can really slow it down and so each player has 45 minutes in which to take all of their actions for the entire game. If you run over you lose a VP each activation, so the game ends soon after that. This is a core and key rule that means that tournaments can run on time. There are a few activities that are not done on the clock but these are usually pretty fast, such as a small clean up phase where in-force character plays are removed and you select your cards for the next turn. Even assigning influence at the start of your turn before activating a player is done on the clock. This should make it easy enough to work out how long you need between rounds. Like Matthew, Paul had painted his team to an incredible standard. And again it was a team I was not familiar with. We started the game and I was pretty unsure of what was going on but once again I received. Skulk was out of the team for this game with me bringing Cosset into play. This line up is one of my favourites as you can get an effective 19 Influence team! They receive 13 as a base (4 from Scalpel, 1 from Vileswarm, and 2 from each Squaddie) plus Cosset and Vileswarm have Furious allowing them to charge for free (normally 2 Inf each). Then finally for 1 Momentum point vGraves can give 2 Inf to Vileswarm. If I score a goal on the first turn then I’m up to 20. The balance is that the team isn’t as efficient with it as other teams are, with few buffs. Matthew kicked but over-extended with his Captain which allowed me an easy takeout. Bonesaw once again scored in turn 1 to put me 6-0 into the lead. At this point it was looking bad for Paul but he recovered to play well and assert the dominance of his team. 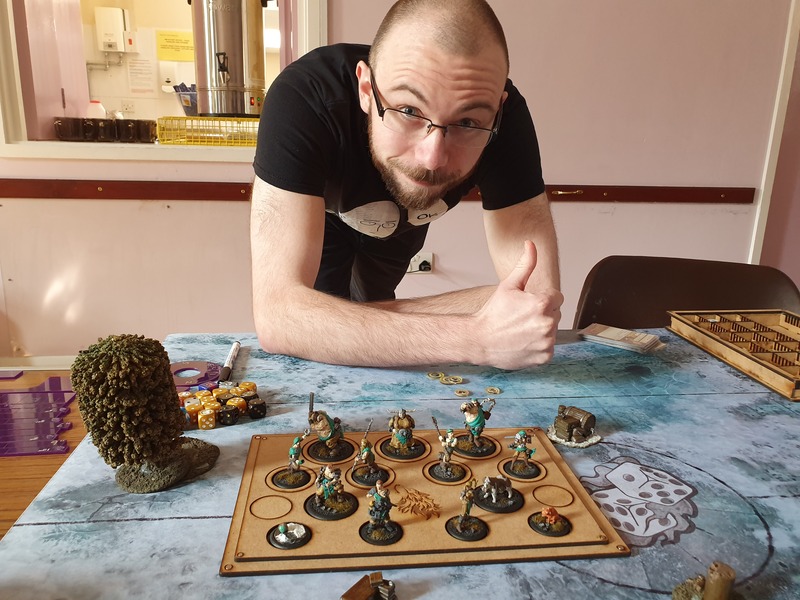 Scalpel managed to get a couple of players down to very low health but a great bit of resource management and turn order from Paul saw him get the health of these players right back up. Then the bear attacked and all of a sudden it was 6-6. Once again my lack of skill in the middle part of the game was letting me down, but this time I had at least traded it for some advantages wider, with Scalpel and Bonesaw both lurking dangerously. I had also recovered the ball. The play was getting frantic at this stage as we were both getting low on the clock with about 3 minutes each when I saw the opening. I would need to sacrifice a player to open the gap but then Scalpel could go in to finish off an enemy and then Bonesaw would be able to go on a winning goal run. I activated vHemlocke who did what she needed to do. In came the bear and ripped her arms off. Paul went into an 8-6 lead, but I was not worried as Scalpel would go in next, make the takeout, and then I just needed Bonesaw, who was now out of range of any enemy threat, to roll a 4 on at least 1 of 4 dice, each getting a reroll. I had 2m16 on my clock and Paul had 2m30 on his. This was exciting, I’d never been in so close a finish before, and I knew that I still had to work quickly but accurately as if I fluffed my lines I’d end up losing. And then Alex called the end of the round. This was gruelling. It was not so much that I had lost the game (although that added a frustrating edge to it), or even more importantly that you had this amazing exciting finish which is why you were playing the game in the first place, but that it was so totally unexpected. With over 5 minutes left on our clocks combined in a game system that was so specifically careful around time being a resource how could this have happened? It was also the lack of warning – had I known that we were about to be forced to end the game I could have sent Scalpel in first to go 8-6 up for a then 8-8 tie (if that is even a thing?). In other game systems where there is an overall round timer this is prominently displayed so that both players have an understanding of the situation. I asked Alex why we didn’t get a warning and he said because players could abuse it by knowing how much time they had left. That feels like a weak answer to me as a canny player interested in doing this could simply put the time left on a stopclock on their phone. It was a bitter end that soured what could have been a great game, and I have to admit that after this mentally I was done with the tournament. And this is no reflection at all on Paul who was a true gent and wonderful company for the entire game. Game 4 vs Jon Clemens (Butchers). At least game 4 was against one of my favourite people in the GB community. Jon always has a smile on his face and despite my low mood I could not help but laugh through the game. I’d played Jon only twice before and both were Morts vs Butchers. We stood at 1 win each with the last game being a strangely football focused one. Not so here where his Butchers were out for the kill. I also think that Season 4 is a lot closer in the guild strengths than in previous editions and this means that people like Jon who had suffered with teams they loved which were not top of the meta were really starting to shine and see good success in tournaments. Jon was a far more successful player than he was at the start of S4 when I last played him. There was no gap between the rounds either, so at this point I just wanted to push pieces around. And that’s why I picked Brainpan and Memory. Well I also knew I had to go more football focused, but the puppet and puppetmaster combo is great fun even if not the most powerful. Once again I was receiving. vHemlocke had dropped out as although Butchers are good at putting out the Bleed condition I was not worried about that as whatever was bleeding tended to be dead anyway. Cosset retained her place as her Lure could be useful for isolating a single butcher away from the lines, killing it quick, and then running away. Once again I received but Jon crowded the middle meaning that Bonesaw was down to 2 dice – although I still needed to get a 4 on one of them with rerolls on both. 2,2. 1,1. BONESAAAAAAWWW!!!!! Without the score it meant I could not dodge Bonesaw back to some safety and he was quickly killed. I then watched as my team was pulverised. Bonesaw came back on around the edge trying to be in position for a counter goal. But in the end it was only Scalpel that saved me from a 12-0 whitewash. Jon played well and would have won anyway. Game 5 vs Simon Chard (Alchemists). Scalpel gets 6 because she is Scalpel. Vileswarm gets none because they can charge for free if needed and vGraves should go first to give them the maximum 2 that they are allowed. Bonesaw gets 4. One to sprint, one to shoot, and one to use Meditation for the rerolls. This adds up to 3 but the goal run is so important he gets a 4th “just in case” – for example if he needs to charge instead of sprint to bounce off an enemy player on the way. Cosset gets 2 or she gets 0.
vHemlocke gets 2 or she gets 0. Why so many players with 1? To pass the ball. 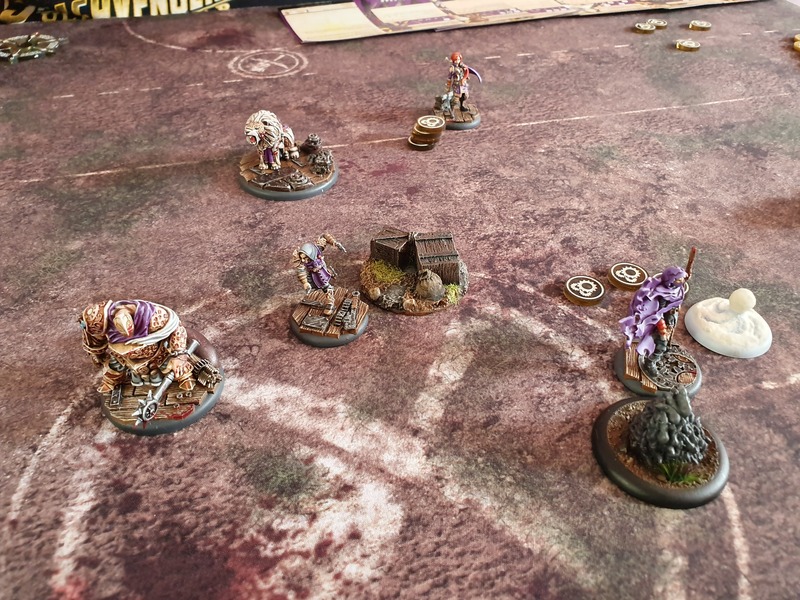 The job of Cosset and vHemlocke on the first turn, as the enemy is usually out of range to do anything but a cheeky trick, is to get the ball and pass to vGraves to make it safe. They are placed on either side of the line to cover the kick in either direction. Whoever is on the side of the ball gets 2 Inf to sprint and pass. vGraves gets one Inf to pass to Bonesaw for the goal run. Or if I am brave to pass to Scalpel who will then pass to Bonesaw to get an extra 4” of movement to go kill someone. This order is especially important against Midas, the Alchemist Captain, who is a very good goalscorer. Of course I forgot to give any to vGraves. I only noticed this after I had passed to him which meant that unless he unsnapped the ball to someone else the ball was dead. Mistake #1. So you can unsnap the ball and snap it to another player, but I thought that it would be a bit better if instead of doing that I just left it loose at the beginning of the movement of the player so that someone else could pick it up. Mistake #2 (leaving it free) and #3 (doing it at the start of the move rather than placing it safer mid-move). Then, with Midas out of range, I moved vGraves a bit forward to screen the ball putting him in range and therefore opening Midas as a threat. Mistake #4. Yep – Midas charged in and scored! I only had myself to blame and then set about killing Midas. We ended up in an almighty scrap but the effort to make quick kills meant that I was not healing enough. Eventually I just took too much condition damage and with multiple players down to just a few health Simon has his pick of the litter on getting to the winning score. Just shows how important the start is! Simon was very kind enough to offer to let me move an Inf from another player onto vGraves as well but I felt that this was not the right things to do. You have to own your mistakes. All 4 of them haha! 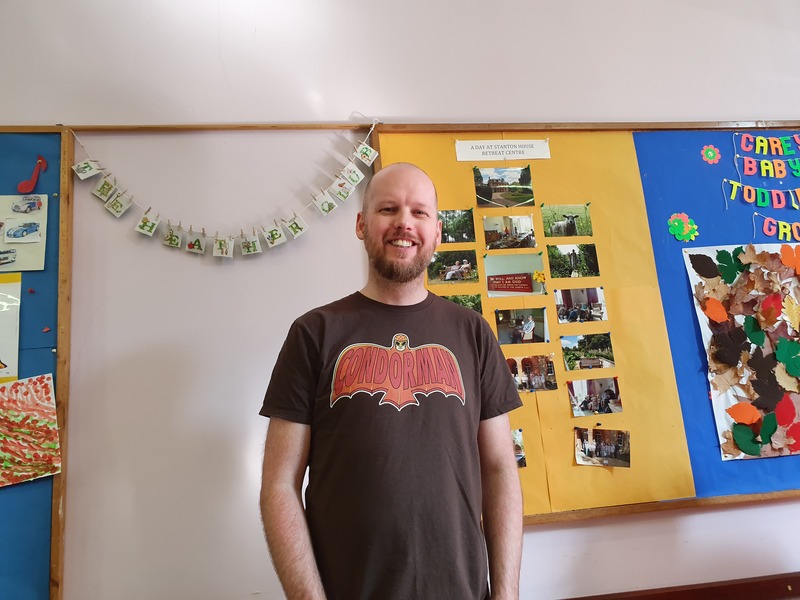 It was close at the top tables near the end with Francois Langton narrowly achieving victory against Conor Rooney for the title! Although sadly this again was decided by the round clock rather than the player clocks with all 3 of the top tables being called. 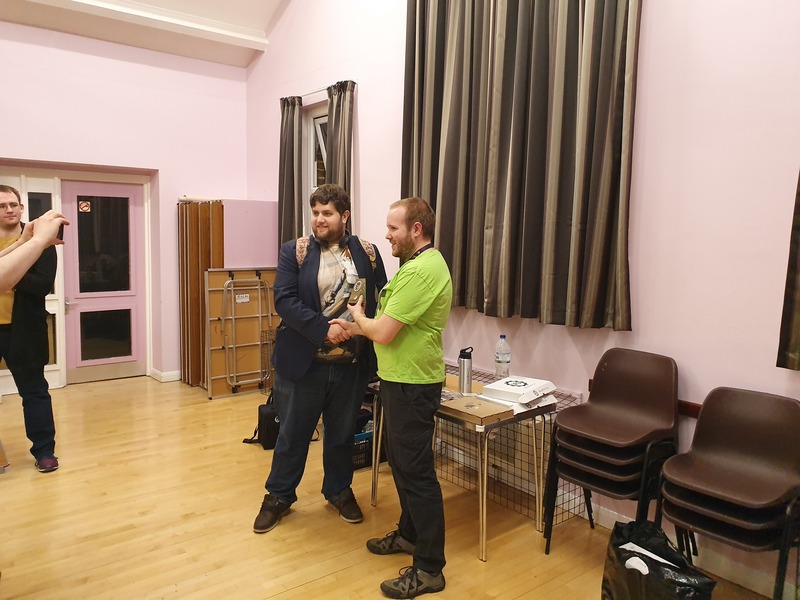 There were some great prizes provided by Alex in the form of some limited edition models that can be really hard to get now. At least I managed to avoid the wooden spoon! A big thanks to Alex for a really well run event, and to the lads at the Hemel Hempstead club for their hospitality. The venue was great with easy outside access, and plenty of refreshments on hand as well which were much cheaper than they could have gotten away with. We also had 16 great pitches with the right amount of fully painted scenery. One thing I have noticed about the culture of Guild Ball as well is how much effort people put into their teams to make them look the best they can be. Not everyone is an amazing painter (although Guild Ball has a lot who are! ), and some people like me cheat and get them pro-painted, but everyone without fail I have seen has done a great job and this really helps the feel of the game. Being in a game where the miniatures all just look so good on pitches with scenery that add to that gave the day that extra buzz. So what next? Well I am continuing my resolve to start playing this more and to try and get good at it this year. 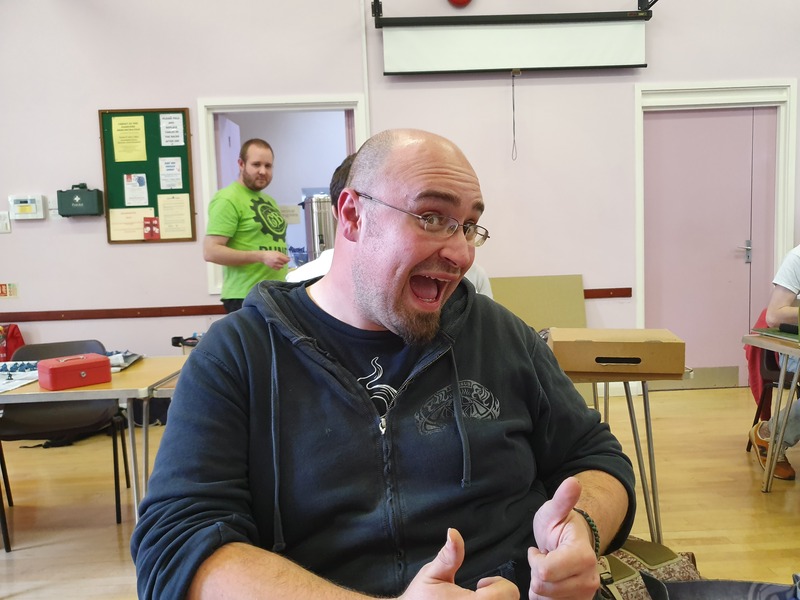 And the guys at Hemel did mention something about a team tournament… maybe Wil and Simon want to form a Welwyn Wargamer team with me? In 3rd place finished Albert. Conor took 2nd spot just missing out in a tense final game. 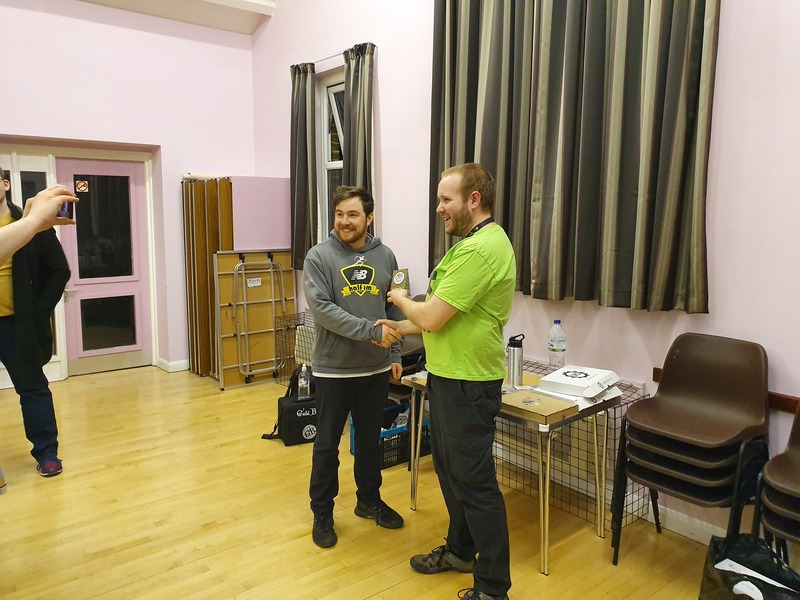 And congratulations to Francois for winning the Hemel Hempstead tournament!